Blackjack is a wonderful casino game! It is highly popular worldwide in land as well as in online casinos. Blackjack card game is complicated and requires lots of skills from players to become successful. Blackjack players have to train hard and learn how to play blackjack, with its strategies and principles in order to succeed. There exist various blackjack variations that have their rules of playing. However, it is advised to know rules of blackjack and basic blackjack strategy to get the basic understanding of the game. In addition to that the blackjack strategy chart and blackjack books will be of great help. Being a highly intellectual game, blackjack scares many players. Many of them will feel more secure and confident after reading this article as it contains many useful information and necessary blackjack tips. So, in order to get to know the game better and increase the blackjack odds, players are provided with the helpful blackjack tips. Practice online before playing in land casinos. Why online? Online casinos offer players a great opportunity to master their skills in the game they choose for free. It means that if players are new to blackjack, they can learn how to play and then gamble for real money. Manage your bankroll carefully! Players have to estimate the sum they can spend on gaming and do not exceed it. That prevents from spending too much money. Choose the blackjack table carefully! What does it mean? Every blackjack table has its maximum and minimum bet, so it is advised to play at the table where the maximum bet is lower than 5% of the bankroll players are ready to spend. This way, players allow themselves to play longer and enjoy the game. Use basic blackjack strategy chart! It is highly advised to learn this chart by heart as it the most helpful tool in the blackjack game. All the basic situations are already calculated there. Do not try to beat the other players! The aim of the game is to beat the dealer, not to be better than other players. Avoid insurance! That means if you are not using card counting you are almost never going to win this bet. Split wisely. It is advised to split Aces and 8s, but never face cards or 10s. There can be even more pieces of advices to be given but these are the most basic and useful ones. Play wisely and do not simply rely on your luck. 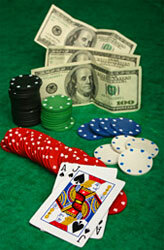 While these tips are for blackjack, some of them can be applied to many casino games, including poker and other games.